These boxes come in different sizes so you can use them for different purposes. I got a more or less medium sized one for the top of my dresser and for the inside of my drawers, to keep things separate and organized. The boxes are fairly large as you can see, and they help keep the top of my dresser tidy, because I have a lot of overspill. That said, I’m not your normal person with a normal skincare/makeup collection, so I’m the exception to the rule. I keep one box for makeup I’m currently testing/using and I rotate them every few weeks. It helps me focus on a few items at a time and helps me also use items I might have otherwise forgotten about. 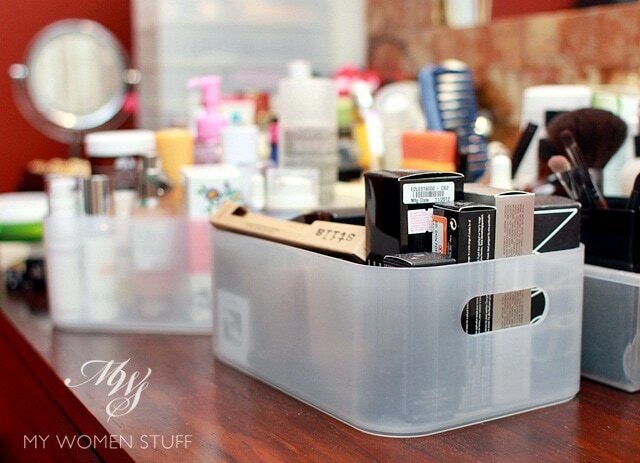 Again, I’m the exception to the rule so you could have many other uses for these boxes, like using them to store your makeup or skincare or knick-knacks or lotions. I have one on my bedside table to hold my body oils and creams as well. 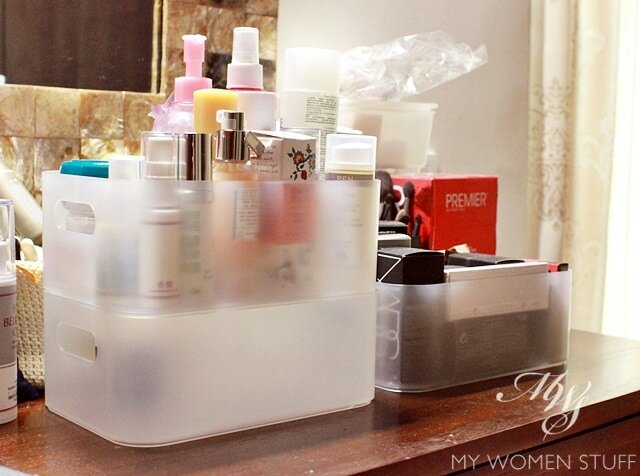 You could quite easily use this to hold all your skincare on your dresser top so they are neat and tidy. There is a taller and larger box if you’d prefer not to have the items sticking out like mine. They don’t have a lid, but there is a shallow tray sold separately that you can stack on top which serves both as a lid and as a tray. 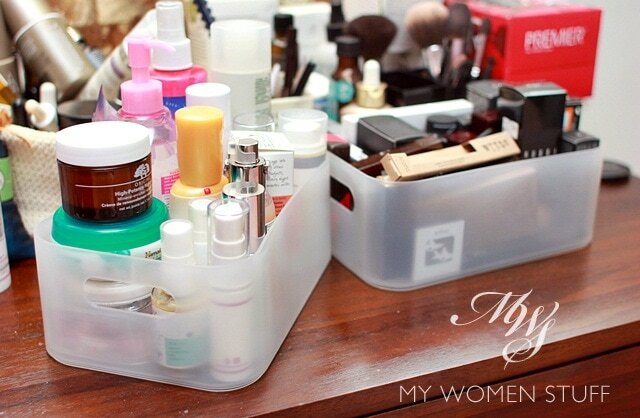 The boxes do stack up as described, so you can build your own skincare/makeup tower. However, if you plan to stack them up, I recommend buying them at the same time and testing them in store first. Mine don’t stack up properly as they are from different batches and to be honest, the quality, while good, can be rather touch and go in terms of lining them up for stacking. I however, don’t plan to stack them so I’m not fussed about that. This is a selection of items in the same product category that I took in one of the Daiso stores. The one I got is on the left and you can see the larger and taller box on the shelf above. There are also lower trays/boxes which you can see on the right, and also, a box that comes with dividers that you can use to hold makeup brushes or eyeliners or mascara. I thought about getting a few to see how I could use them but decided against it in the end. RM5 or not, it’s still money that I’ve got to save for uncertain times ahead 🙂 But I’m sure you get the idea on how you can mix and match these to suit your purposes. Do you use these stackable boxes from Daiso too? Or do you use the similar ones from Muji? Yes! I love how they keep drawers so well organized and separated and things are much easier to find too! I use exactly the same box from Daiso as well ^_^ found some other stackable ones at a Japanese store at Nexus Bangsar and another Japanese store at 1MK as well. for me these three shops offer a cheaper option than Muji’s and Robinson’s. Planning to get more! Woohoo! I didn’t know about other stores, but yay for finding cheap dupes! 😀 I loved the look of the Muji ones, but I’m so glad we now have cheap alternatives that work just as well and look just as good! 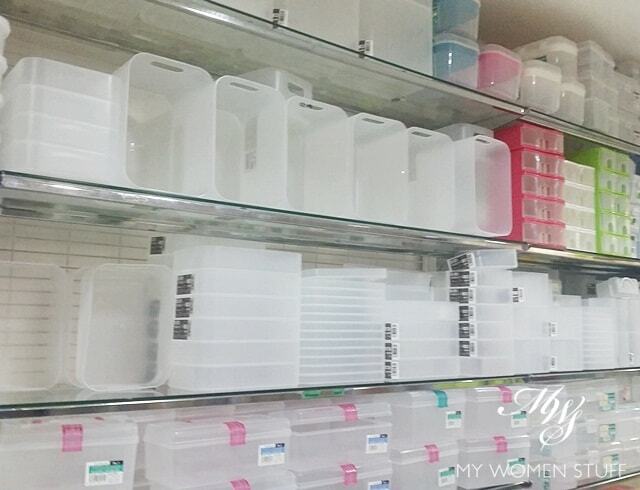 I use these boxes from Daiso in different shapes and sizes in my entire house – bedroom, bathroom, kitchen. They make my life seems so much more organised and keep my clutter looking pretty(?). I have used them when I was in KL 🙂 love Daiso for affordable items and good quality as well! Oh I went to Daiso Avenue K last week , i saw lipsticks organizer (literally). But there are only two available and I dont need another lipstick storage so I pass on it. I bought their storage with compartments which I use to place my blusher and eyeshadow palettes. I prefer the ones with compartments coz the other palettes will stay in place whenever I grab one. I wish we had daiso in the UK! Sadly, we don’t have large stores like this here to stock up on the essentials. We do have muji though! i love these boxes!! they are identical to the Muji ones but at half the price! now my dresser is neatly organised and all makeup nicely stored! wished they had the drawer ones tho but love Daiso nonetheless!!! Definitely my favourite storage boxes with affordable price! Man, I’m over over this! But, as luck would have it, I don’t live in Asia. So sad. If I do ever visit Asia, I know Daiso will be one of my stops!! I love your blog. I’m glad you’ve been back! I’ve got a few bowls and mugs that I use for makeup, lipsticks etc. That works for me as my stash is smaller than yours. Your storage looks excellent though, but we don’t have that shop here :(. They look really decent and very Muji-like! Yay for Daiso. I bought some cloth containers for my son’s toys just to neaten up my living room. And I also nabbed some cute perfume sprays that you can decant fragrance into. Daiso has amazing stuff for the home. I tend to get my everyday type plates and bowls from there. The funny thing is, I buy them because they are cheap and think I’ll break them easily but they NEVER break. They last for YEARS! LOL! LOL It must be heaven living in Japan and all their 100 yen shops! I know I’d go mad if I were there. Imagine the choices! I am a huge daiso fan mostly because of their huge stock of very usable (and cheap) stackables and organizing thingies. Does Daiso have it in stock until today? I’m trying to contact them for this product availability. The nearest Daiso branch is a few miles away, I’m hoping someone can inform/update me before I travel there.